I feel like writing about the Greek crisis. I discover that I wrote about the last one, so I’ve nicked my witty headline from then. The situation as it is now, or at least my reading of it: the Greeks have caved in. After lots of posturing, the reality of two weeks of banks shut and no other way out than leaving the Euro has left then against the fundamental political reality of their present: they want to stay in the Euro. Numerous people have argued that Greece should leave the Euro, including some who believe that the Euro is in principle a good idea. However, that’s not what the Greek people want. They want to stay in, by a margin significantly larger than voted “no” in the referendum. Quite why is open to speculation; its doubtful that even a small minority understand the economics. My guess is that they very definitely want to stay in the EU, and fear that exit from the Euro might be a slippery slope to leaving the EU1; or being second-class members like us; or they’re just mixing up the concepts. But it hardly matters: what matters is that they wanted to stay in. Despite that, Greeks like free money, early retirement and a life on the beach as much as anyone else, so last January they voted in Syriza on a platform that yes there really are fairies at the bottom of the garden who will hand out free money with no strings attached and no hard work required. No, it never works out in the fairy stories either; there is always a catch. This was a shame, as the government voted out was finally starting to do some sensible things; so it goes. Democracy is the theory that the common people know what they want, and deserve to get it good and hard. 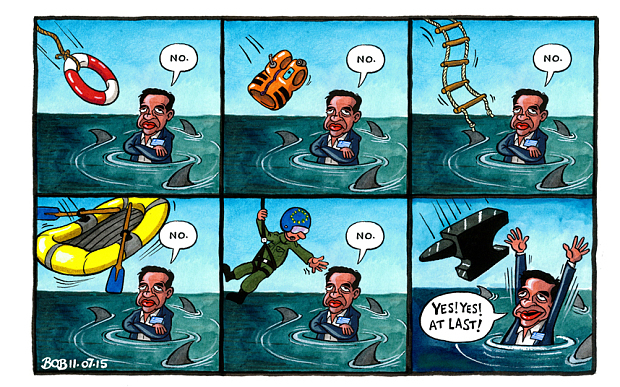 Syriza, I think, genuinely wanted to deliver an end to austerity, but are fundamentally incompetent, so couldn’t. The only way out was to leave the Euro, which would have been risky, but the only way to get there would have been to believe it and prepare the people for it; they weren’t going to do that. So we were treated to the spectacle of five months of incompetent negotiations. International diplomacy is tricky, I think. Especially dealing with new people. People get taken on trust, to some extent. Its taken quite a while for everyone to realise how useless Syriza are. There’s a lesson here, also available from Syria or Mogadishu: incompetent government is the worst thing. The proposals Syriza are putting forward, now, are about the same as what they could have put forward five months ago. All this time has been wasted. I’ve seen numerous people write, gleefully, about how marvellous the Greeks are for sticking up to the capitalists, or similar phrases. These people are idiots, and their words just empty sloganeering. Enough useless carping. What should they do? If it was up to me, they shouldn’t have elected Syriza. But, lets say what should they do starting now; we’re not allowed to go back and change the past. Then I think they really need the restructuring. They should be doing that anyway, starting now, not using it as a bargaining chip. Addendum: Yes to the Euro? As I’ve commented, the std.econ case for Greece leaving (indeed, never having joined) the Euro appears to be strong (disclaimer: I’m not an economist, so I’m going with the flow of people I trust). But as I’ve also commented, this isn’t a pure econ decision. Nor are we able to rewind time and have them not join; nor can we give them the option of leaving at a time of their own choosing when things are otherwise smooth. Leaving now would be an emergency decision in a time of crisis, and quite likely a bad idea even from an econ perspective. Like mt, I’m not terribly convinced that std.econ covers dynamic situations well. Modern, prosperous economies in Europe and the world are based on the market and on healthy competition… an efficient public sector, which operates independently of the current government… Greece’s participation in the core of Europe fosters long-term convergence to European institutions. By contrast, a Greek exit from the euro would strengthen the tendency to clientelist structures and aggravate the timeless pathologies of the Greek economy. This inevitably leads to a closed and impoverished economy with high corruption levels. I agree that’s a good argument: Greece needs the discipline of the Euro; without it, it will sink back into the problems that have got it where it is. Whether its stronger than the std.econ argument that the-Euro-is-not-an-optimal-currency-area, blah, I can’t tell. BTW, in case it wasn’t obvious, my made-up headline is a reference to the 2011 “Greek PM drops euro referendum plan”. Not to anything rude. A thought I meant to add earlier. Any number of articles (example) note that the EU has lost trust in the Greek government. But they’re being asked to trust the Greeks again: here’s another set of proposals, late, clearly rushed. Do we believe that you’ve even thought them through? Unlikely, in the time available. Have we got time to think them through, carefully? Can we talk through them, so we can trust that you really understand them and will indeed implement them? There’s no time. Do your statements outside these meetings indicate that you’re committed to seeing these reforms through? No, quite the reverse: outside the meetings the Greek govt presents fiery rhetoric and accuses the Germans of terrorism. There is every reason to think that they aren’t committed to these proposals. So how do the EU tide them over the current crisis, and yet keep the Greek feet to the fire? Some answers, for example from the Graun. I think the language they’re using there is deliberately inflammatory – this is irresponsible of them – but the (deserved) lack of trust in the Greeks is plain. A feature of this crisis has been a variety of people – mostly the Left -going “ra ra! Go Greece, stick it to the Capitalists!” These people are idiots. In their defence, they aren’t thinking at all: they’re simply projecting what they want onto the current crisis, which happens to be this one. They know nothing about what is going on, but that doesn’t bother them, because they aren’t even trying to talk about what is going on. * The end of the lifeline – plumbum. You should probably read this too; though it was written two weeks ago. I agree with much of it, but not the “chicken” bit: the Greeks have been playing it as a game, yes, but the EU haven’t been; and the Greeks are now discovering that their chicken is going to smash into an oncoming tank. * IMF stuns Europe with call for massive Greek debt relief – Torygraph. * AN UPDATE OF IMF STAFF’S PRELIMINARY PUBLIC DEBT SUSTAINABILITY ANALYSIS: Greece’s public debt has become highly unsustainable. This is due to the easing of policies during the last year, with the recent deterioration in the domestic macroeconomic and financial environment because of the closure of the banking system adding significantly to the adverse dynamics. * More fuckwittery, this time from Reuters, July 17, 2015. 1. For example Now a deal has been done, what lies ahead for the Greek economy? from the Graun, with “Our entry to the EC was the second most important date in Greek history after the war of independence,” says Thanos Veremis, emeritus professor of political history at Athens University. “If we left the eurozone, we would have to adopt policies that would lead very quickly to the country leaving the EU – and that would be a national catastrophe.” Its not clear to me why he believes this – I mean, the “we would have to adopt policies that would lead very quickly to the country leaving the EU” bit – but he clearly does. They should bail. As you say the Greek voters don’t seem to think that’s desirable, which put Syriza between a rock and a hard place, but a few more years of German-inflicted pain may make an end to that thinking. The Germans should try to come up with a plan with at least a glimmer of hope at the far end, but their own voters seem to be dwelling in economic fantasyland as well. Umm, so how is this going to play out in the long-term with respect to the citizens in the rest of the EU? We’ve now got a country with initimate access to EU markets and with a population that will probably work for rock bottom wages. Enjoy. Dracmaize. The Euro is a poor idea as you Brits realized from the start. Well, I wouldn’t start from where they are, but the sensible thing is have elections, get rid of Syriza, go to the markets and beg for mercy. Raise pension age to 67, start to tax shipping companies and other rich people, encourage the young to emigrate to Germany and Britain and learn enough skills to benefit them upon their return. I suspect that the Greek in the street likes being in the Eurozone because, however incompetent and heartless the Eurocrats are, they are better than the venal and corrupt oligarchs who would take over if the Greeks withdrew from the Euro or the EU. I have a feeling that lots of people in both Greece and Germany haven’t thought this through. Being in the Eurozone gives Greece all the disadvantages of gold-backed currency (e.g., devaluation is between difficult and impossible) without the advantages (e.g., actually having gold). It’s not a sustainable situation. Among the various bad outcomes here is that Golden Dawn will form the next Greek government and get the credit for improving the situation, whether by luck or by abandoning the euro, as Syriza should have done. Parties of that stripe have already had some success in Europe, thanks to a combination of high unemployment and latent anti-immigrant sentiment. Merkel’s country was on the other side of a similar situation about 90 years ago, so she should know this better than most. I know almost nothing of this. I do know that the Greek finance minister resigned, because the other nations couldn’t work with him. And I suspect that was because he probably pointed to the simple maths that showed the Greeks would owe more every year, and that there was no chance of this working. When is it ok to repudiate a debt? [I’m not sure how you get that. Greeks aren’t obviously keen to work for low wages -W] And you base that assertion on…? And it doesn’t matter if they’re keen or not, what choice will they have? Monetary union without strong political union has a lot of things going against it. The Euro is overvalued from the point of view of Greece and the other laggards but undervalued from the point of view of Germany and the other strong economies. Suppose they had separate currencies (let’s call them the drachma and the mark). The drachma would decline in value and stimulate Greece’s economy by making Greece’s exports cheaper among other things. Instead a single currency is pro-cyclical, making the rich richer and the poor poorer. It might work with careful management and political will but I haven’t seen much evidence of the former in particular. [I base it on all their whinging about having to actually work -W] Spoken to a lot of Greeks have you? A representative sample? Pardon my scepticism. And you ignored my point that the privatisations will be to foreign investors, as the Greeks don’t have the money. In addition, these are forced sales, so the Greeks are in a weak bargaining position. Attaboy WC, this was your best posting yet. Looks like the thin wedge of reality is beginning to mug you unbeknownst. I look forward to the Scrooge-like cur that you will become, an honest man at last. It is a sad day for Europe and Greece is the Greek government has indeed caved in and agreed to the Troika’s austerity program (which includes cuts to pensions [average ~800$] instead of tax increases to the wealthier Greeks, which were considered unacceptable by the Troika). [but didn’t, as the economy tanked]. Also, which country has the more generous welfare state, Greece or Germany? As to the reference in Comment 9 Timmy, who points out that Greek debt is held by [taxpayers], that is the result of Greece’s previous bailout, which transferred private holdings of Greek debt (which were so enthusiastically sold by Goldman-Sachs and friends, until they decided to short-sell them) to the ECB and other non-private funds, transferring risk from private to public, just as the AIG bailout in the U.S.
Greece’s economy has many problems, among them, that their wealthy people – just like ours in the U.S. – don’t like to pay taxes. (Wealthy Greeks avoid taxes by corruption, U.S. ones by getting Congress critters to write favorable tax laws and many deductions [oil depletion allowance, ‘carried interest’,…]; both use foreign tax shelters). the underlying reason of Greece’s problem is that it is stuck with the Euro, like with a Gold standard, making foreign exchange adjustment impossible. And there is the historical point, Germany’s debt had also been forgiven after WW II (and in the late 1920ies, after WW I, otherwise Germany would still be paying), as Thomas Picketty recently pointed out. Attaboy WC, this was your best posting yet. Heh. You’ll testify for our host, and climate science by association, against charges of leftism then 8^D? 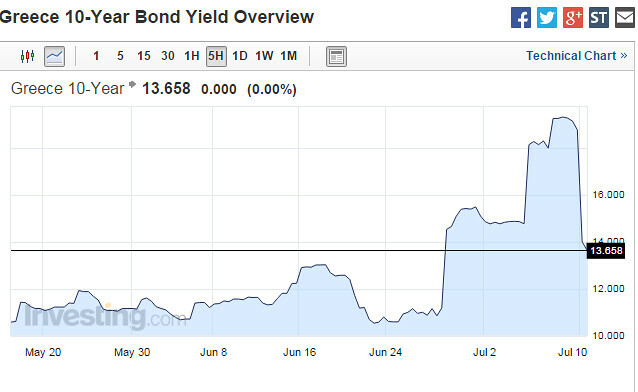 25bn in 2 weeks not a bad rate of value destruction…. Greeks over 2,000 hours/ year Germans less than 1,500. First, the data say nothing about the country as a whole, as they give average hours worked per worker. Taken to an extreme this could be one guy working 2042 hours and the rest of the country just groovin’. “the ones in work but doing pointless-or-actively-harmful govt bureaucracy”. Of course, the ones that work in pointless or actively harmful private businesses are never a problem. Oh never. #18 Good point, in that case maybe our host could supply a source for his whinging about having to work claim. In any case it’s all moot. We’ve seen the beginning of the end for the Euro. Only a real basket case wouldl want to join now… And who would have them? Not useless people, not what I said. I said useless or harmful businesses. Under the useless to harmful category: pimping, tobacco sellers, heroin sellers, many multi-level marketing companies, various frauds and scams, and on and on. All profitable. Saying “in economic terms” is making the assumption that anything profitable is good. Many things that not good are clearly profitable. To me saying “Not in economic terms, no.” seems like an admission there may be non economic ways in which activities might be bad. So I don’t follow your ‘not what I said’ complaint. I would certainly put pressurised sales tactics people on the list of harmful but profitable activities. Not quite sure what you are referring to with “multi-level marketing companies”. If they boost sales for their clients or even if they don’t but the clients think the money spent was worth it, does this boost gdp? If the product is harmful or the marketing is to persuade politicians to pass favourable laws or the marketing is pressurising people into bad choices then it can be bad in those ways. If those sorts of things are not present when is marketing good or bad? Is it simply a matter of whether it boosts gdp? Maybe boosting gdp through marketing almost always a bad thing in that people think spending money will make them happier but it generally doesn’t and a simpler cheaper lifestyle should be preferred? If people really want to buy some item, they can do their own research of what they want and buy it easily and people avoid all the marketing messages being pushed down their throat. If this is the sensible view then governments should progressively implement a ban on all marketing. I think that would be very bad for government finances though and is therefore unlikely to happen. If you are trying to express some form of the above view, then I really don’t get the ‘multi level’ marketing bad (single level presumably ok?). [quote=BBC]In a TV address on Tuesday, Mr Tspiras called the proposals “irrational” but said he was willing to implement them to “avoid disaster for the country” and the collapse of the banks. He presumably is saying he thinks he is rational to accept the terms but the creditors are irrational to demand such humiliating terms. When is it sensible for creditors to throw more good money after bad? Demanding some evidence that the profligate ways are gone and won’t return seems like the most obvious starting point and he cannot fail to have understood this. To international creditors the demands seem inevitably necessary not irrational. Saying the terms are irrational seems like he hasn’t realised he has to portray an image that reforms have to follow; instead it looks more like why not just drag out negotiations like this time and next time it will be even more obvious that Greece cannot repay all its debts and needs more debt relief. A guess the more charitable view is that this was solely for a domestic audience saying this isn’t my fault it is those crazy creditors with their crazy demands and they should have agreed to what I was proposing. That he didn’t come up with much in the way of credible proposals is a slight problem with that position, but maybe he can get away with that. [I think its for domestic consumption only. He has a difficult task ahead – which is worrying, because he’s not competent – which amounts to selling austerity to people who voted against it, as a person specifically elected on a platform of no austerity. The reply was a change in topic, from “companies that do harm” to “companies that hire worthless employees”. Clearly a company that does harm can hire competent employees, and not all employees of a company doing evil need to be directly participating in the evil. I assert that the market has no inherent feedbacks to correct companies that are both profitable and harmful or useless. To clarify, my comment wasn’t about Greece, as a partly worthless government (to say the least) is indeed a large part of the problems that Greece is facing. There are worthless and harmful governments as well as companies. Not sure I see much difference between what we are each saying. I would at first suggest it has to mainly be the role of government to tax/inhibit/outlaw profitable but harmful business activities. While on first thought the market may not appear to have any inherent feedback. However, in some situations there may be a role for some combined govt and business feedback: eg Financial Statements rules to require the company to gather and publish info that possibly reveals some harmful effects and this might cause a good business to close down a harmful segment of its business rather than publish the info and damage the whole company while a wholly bad business might suffer adverse publicity. Is that a market mechanism? Perhaps but it is difficult to say it is an ‘inherent market feedback’ mechanism as such rules are not necessarily required by a market. So this looks more like a govt inhibit mechanism according to the terms you used. So it is beginning to look like you managed to exclude many of the feedbacks by the form of words you used. “market has no inherent feedbacks” excludes government actions and also business mechanisms that exist but are not inherent to markets. So according to the wording you may be able to defend that position but it seems like a bit of an irrelevance because your wording excluded so much. Is it possible to envisage a good Multi Level Marketing scheme (i.e. beneficial to all involved or at least large majority of people in each class of involvement such as customers, employees, general public, people living near activities)? Is your beef just with the often attendant problems like pyramid selling, exploitation of employees, cult-like indoctrination, pressure selling tactics, and so on rather than MLM itself? Should MLM marketing be banned even if it is possible to imagine isolated cases where it might be good? Looks like those squishes at the IMF are siding with the faeries. There are several options. If Europe prefers to again provide debt relief through maturity extension, there would have to be a very dramatic extension with grace periods of, say, 30 years on the entire stock of European debt, including new assistance. … Other options include explicit annual transfers to the Greek budget or deep upfront haircuts. What are you calling “free money”? Let us not forget that Greece was lent this money by private sector banks. Yes, it was those ultra high paid, genius level turbo capitalists who thought that lending to Greece – a country with a history of bad governance and default, and no evidence of reform – was a good idea. But instead of the private sector banks taking the hit when Greece noticed that it was bankrupt (which would have crashed many of them, but that’s your good ol’ creative destruction), the debt was taken on, stupidly, by governments – Germany, France, Italy et. al. So. Greece is bankrupt – as in there is no realistic way it can ever repay it’s debt on commercial terms, given that it does not have it’s own currency. That is a statement of fact. However, the other Eurozone governments cannot admit this, because the implication is that the huge chunks of Greek debt they have taken on is mostly worthless. So we have perma-austerity imposed on Greece, under the pretense that somehow this will help. It won’t – shrinking the economy just makes the debt worse – but it sounds good, and fits the political narrative of ‘lazy shiftless greeks’, which is a much better narrative for the German government than ‘we just lost 100 billion euros of taxpayer money’. So. If we treat this as a bankruptcy.. then either we have a large scale debt write off – something like 70% – combined with full reforms in Greece, or Greece exits the Eurozone, dosen’t reform, and the debts are re denominated in Drachma. Which means they’ll lose 70% of their value, plus or minus. Those are the two options for bringing the crisis to a close. No amount of whining about ‘other people’s money’, ‘shiftless greeks’, ‘neoliberal troika’ or whatever will change this. Stupid lenders + stupid borrowers, = bankruptcy. The current process – in which quite selective but aggressive austerity and reforms are demanded in return for ‘extend and pretend’ bailouts – means continuous pain for the Greeks and no end to the crisis. It’s a living example of why bankruptcy law exists. Why should the Greeks agree to this? They’ve lost a quarter of their GDP and seen 60% youth unemployment, but are back at square 1. The crisis needs to end. Good analysis for the most part. The problem is that lenders don’t lend their “own” money; they are lending deposits, namely, “other people’s money”. And, as you say, that’s a fact. It isn’t even money. It is a promise of future labor to be paid largely by Germans that had no say in the matter. A similar situation has taken place in Iceland but, not being in the Eurozone, can default and effectively did just that. The bank that so many Europeans deposited into failed. All three Iceland banks failed in the same week and there was no “bailout”. But you are right; there’s almost certainly no bringing that money back. But, keep the debt on the books and maybe some of those investments will repay. Very educative and informative article.